For Some Iowa Voters, Immigration Is Decisive Issue : It's All Politics Of course, the economy is the main issue for voters in Iowa's Jan. 3 caucuses. But as the state's Hispanic population surges, Republican candidates are struggling with how best to deal with voter concerns around illegal immigration. Texas Gov. Rick Perry speaks at a campaign event at Clark Electric Co-op on Dec. 27 in Osceola, Iowa. 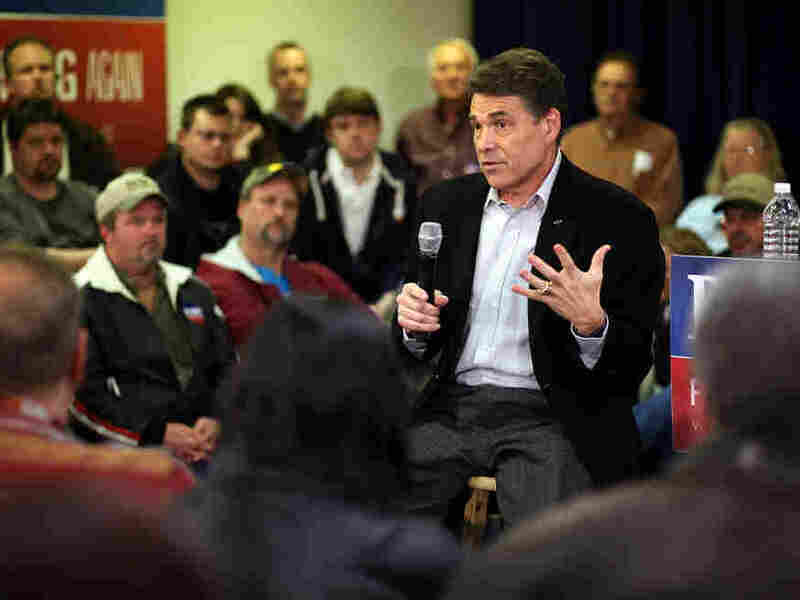 Perry's stance on immigration has troubled some Iowa voters. Campaign buses loaded with Republican presidential hopefuls and their entourages are rolling across Iowa as the candidates hope some face time with GOP voters will help boost their chances in the Jan. 3 caucuses. The main issue for many Iowa voters is the economy. But there's a sleeper issue emerging: immigration reform. Iowa's Hispanic population is surging and Republican candidates are struggling with how best to deal with voter concerns. In Muscatine, Iowa, there's nothing exotic about the family-style restaurant — just big plates heaping with hearty food. It's open for breakfast, lunch and dinner, seven days a week. And owner Nick Filiz says everyone here seems to be listening closely to the Republican presidential candidates. "I'm myself all considering but ... I haven't made [up] my mind," says Filiz. He says that many of his customers, too, tell him they have yet to settle on a choice. "With politicians, there's always a lot of promise. That's a very obvious thing. But who will get the job done. That is the main question," he says. Filiz immigrated from Turkey, legally, more than 30 years ago and he says the issue of immigration reform is a big one in this part of eastern Iowa. Statewide, the Hispanic population has almost doubled over the last decade and is now up to 5 percent overall. That growth is concentrated in some towns and counties where Mexican and Central American immigrants fill jobs in meat-packing and poultry plants, factories and farming. In Muscatine county, the Hispanic population is now 16 percent and growing. And for some employers such as Filiz, the lack of any immigration policy reform in Washington is frustrating. "In the restaurant business especially, you know, you get a lot of undocumented aliens," Filiz says. "I'd like to see that be solved the right way, you know?" Filiz is a registered independent who says he will vote in the Jan. 3 Republican caucus. He favors a path to citizenship for some illegal immigrants, similar to what was done under President Reagan in the 1980s. But among Republicans in Iowa, that position is the exception and not the rule. "I think that people that aren't legal here need to be sent back," says Miles Reiner, a 33-year-old fork lift driver from Muscatine, who's undecided about who he'll vote for. To Reiner, immigration is an important issue. His feelings are echoed by retiree Bob Lamb. "Yeah, they should deport 'em if they don't come in legally," Lamb says. "They take our... they get unemployment, they get welfare, and they pay nothing and they just keep givin' to 'em. That's the way I feel about it." The federal raid of a meat-packing plant in Postville, Iowa in 2008 — the country's biggest such raid to date — has heightened awareness of the illegal immigration issue here. So many GOP voters have a hard time with positions such as former House Speaker Newt Gingrich's, who called for a path to legalized status for some illegal immigrants in a debate in November. "If you've been here 25 years and you've got three kids and two grandkids, you've been paying taxes and obeying the law, you belong to a local church, I don't think we're going to separate you from your family, uproot you forcefully and kick you out," Gingrich said then. Also not sitting well with some Iowa voters is Texas Gov. Rick Perry's defense, in another debate, of his support of in-state tuition rates for the children of illegal immigrants. "But if you say that we should not educate children who have come into our state for no other reason than they've been brought there, I don't think you have a heart," Perry said at the time. "And conservatives really didn't like that," says University of Iowa political science professor Tim Hagle, who explains that Republicans don't like being called heartless by one of their own. Nevertheless, he says most Republicans in Iowa don't like any policy that could seem to reward illegal behavior. But he also notes that hard-line stances, such as that taken by Rep. Michele Bachmann, haven't really helped presidential hopefuls. "Candidates can probably get by with fairly unspecific — not to say vague, but just unspecific — saying something along the lines of, 'we need to secure the border,'" Hagle says. In other words, Hagle says, the right position on immigration won't likely win a candidate Iowa, but the wrong position could certainly hurt.